With Vox's wards shattered, the path to her lair is open. Aspera the Forgotten suggests this creates an opportunity to defeat Vox, but I'm not sure I can trust this strange projection. In order to defeat Vox, you must learn more about her. Aspera tells you to use Anima Crystals located throughout the ruins to watch scenes from Vox's past. The first scene is at the western Anima Archive. Aspera says Vox once willingly served the Tribunal. Her only son, Meram Vox, grew distant and more radical. He broke Vox's heart. In the memory, Urili and Meram Vox are having an argument. Meram welcomes the Daedric Princes as true gods and leaves to defy the Tribunal. Urili Vox collapses to her knees, fearing her son will be hurt. The next scene is at the eastern Anima Archive. 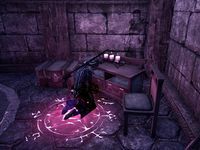 Aspera tells you Meram tried to steal Veloth's Judgment for Boethiah and killed many of the Tribunal faithful. However, Meram was caught and punished. Magistrix Vox witnessed her son's punishment and was powerless to intervene. Almalexia questions Meram, but he renounces her as a false god. In response to this, Almalexia kills Meram, while Vox begs her for mercy. The final memory is in the central Anima Archive. Vox vowed revenge on the Three. Boethiah spoke to her, and Vox turned from a trusted servant of the Tribunal into an agent of chaos. 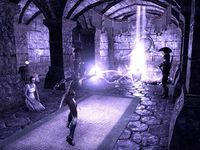 Under Boethiah's influence, Vox betrayed the Tribunal, spread the Llodos plague and stole the legendary hammer her son sought so the Daedra could return as the true gods of the Dunmer faith. However, Vox's power is growing, and she sees you in her memory. Aspera says you are finally ready to face Vox. Aspera wants me to experience Vox's memories so that I can learn what brought us to this moment. I need to find the western anima archive to see the earliest memory. I should attune myself with the anima crystal to observe Vox's earliest memory. Once within the memory, I should speak to Aspera's projection. I need to find the eastern anima archive to experience Vox's next memory. I should attune myself with the anima crystal to observe Vox's next memory. Once within the memory, I should speak to Aspera's projection. I need to find the central anima archive to experience Vox's final memory. I should attune myself with the anima crystal to observe Vox's final memory. Once within the memory, I should speak to Aspera's projection. Finishes quest I experienced memories of Vox's past and somehow she sensed my presence. I should speak to Aspera about this.